Free shipping. Buy direct from HP. See customer reviews and comparisons for the OMEN X by HP Transceptor Backpack. Upgrades and savings on select products. Pack. Leader. Organize and protect all your gaming gear on-the-go. This backpack's spacious interior and adjustable roll-top design give you incredible flexibility to go where the action is. Designed for on-the-go gamers with a flexible roll-top design that adjusts to the amount of gear you carry. Features ultra-padded shoulder straps and a single-hand operable Fidlock buckle for quick access and comfort. Give your gaming gear the protection it deserves. With a protective headset compartment, a padded, ultra-soft 17” diagonal laptop pocket, and rugged, water resistant fabric, this backpack safeguards against bumps and weather. You now have a place for all your gaming gear. Take everything you want with spacious, icon-labeled pockets for your mouse, keyboard, laptop, and more. There’s no better way to protect your HP OMEN gaming gear than with the HP OMEN X Transceptor Backpack. The HP Transceptor Backpack will protect your gear when you take it on-the-go; to a tournament, to an LAN party, or on your travels.It’s constructed with durable materials to keep your equipment safe against the elements. The outer shell is water-resistant and the zippers are taped to prevent leakage. You can trek through any kind of weather with confidence that your equipment is secure.Travelling with tech is tedious because all the cables and components can get tangled and disorganized if they’re stored in the same bag. The HP OMEN backpack solves this problem. 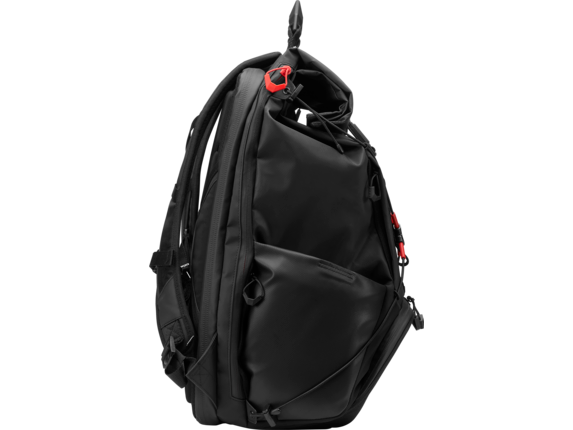 The backpack has icon-labelled pockets and compartments so that you can easily organize all of your gear.Store your headset, peripherals and gaming accessories in separate, protective compartments. Keep your laptop in a special extra-padded compartment that can hold laptop sizes up to 17 inches. Not only does the backpack protect your gear, it also makes packing and unpacking fast and simple.Need even more protection? Check out our full line of an HP laptop bags and backpacks to find the perfect fit. 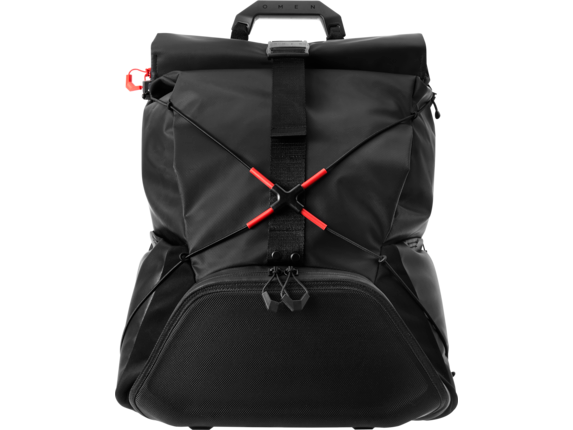 The HP OMEN X backpack has a flexible roll-top so it can compress or expand to accommodate the amount of equipment that you’re carrying. Travelling with lots of equipment? Roll it out. Less equipment? Roll it in. 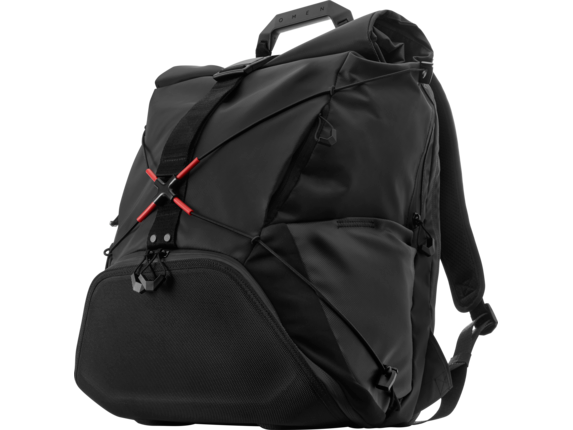 The backpack’s ability to maintain a compact shape when expanded or compressed makes it easier to carry. The HP OMEN X Transceptor Backpack is designed for fast and easy travel. While there are plenty of protective compartments for your gear, there are also easy-access pockets for water bottles and essential items. 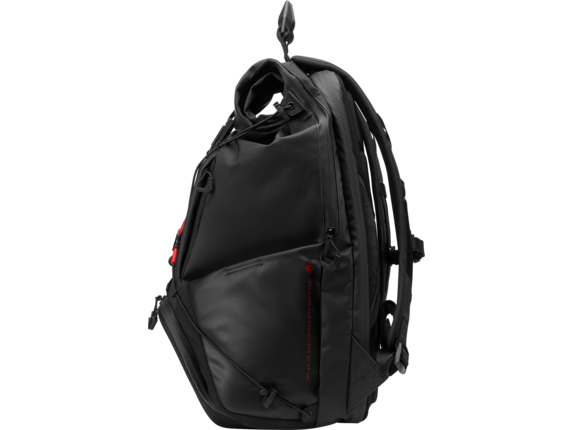 You can quickly access your non-gaming gear without the backpack ever leaving your back!One of the pockets is even equipped with RFID-blocking technology to give you some extra cyber security - necessary when you’re travelling with computer equipment.If you’ve got to do a lot of walking with gear-in-tow, you’ll enjoy the HP OMEN X’s Fidlock buckle and adjustable straps. The backpack is also TSA-compliant, with a built-in trolley handle pass-through so you can stack it on top of your luggage at the airport.Weight is one of your biggest concerns when you’re travelling with loads of equipment. Heavy tech can quickly cause tears in ordinary travel bags. Not to worry, the HP OMEN X Transceptor Backpack has a reinforced handles and seams that can carry the full weight of your gear, no problem.When you use the HP OMEN X backpack to transport your gaming gear, your gear won’t wear down your bag, and your bag won’t wear you down. The HP OMEN X PC and gaming carrier boasts the toughest durability, the most accessible design, and the most travel-efficient build. This is a first-class ticket for your gaming tech. With a sharp, red and black aesthetic that matches your HP OMEN gaming gear, you’ll feel as good about its style as you will about its comfort with the OMEN X Transceptor Backpack.